Specimen Container with Screw Cap is a sturdy, leak-proof container designed to provide complete sanitation for urine collection. Graduated and individually packaged, this container for urine collection is easy to use and comes with a screw cap to keep urine safely stored inside of the unit. 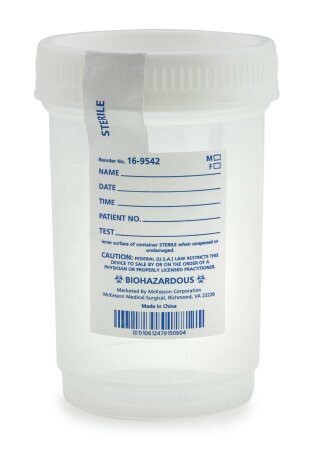 Specimen Container with Screw Cap is individually packaged in a polybag, ensuring that each urine specimen is safely stored. 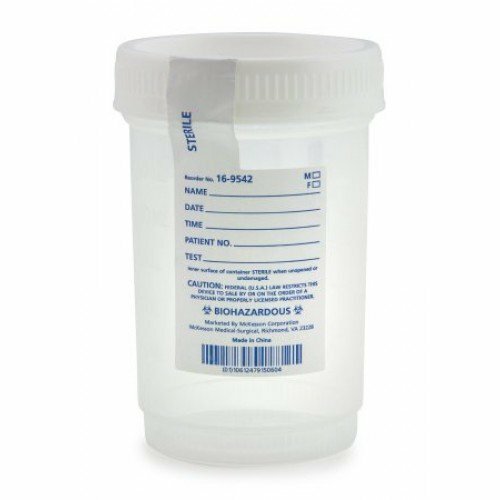 Each one of these urine specimen collection cups has graduations that are labeled in ounces and cc's with a four ounce/120 cc capacity. You might also be interested in similar urine collection items and products that we carry, such as Urine Specimen Bottle 24 Hour Collection 3000 ML. Labeled in ounces and cc's: 4 oz/120 cc capacity. Worked great as a Halloween prop! I ordered these specimen cups to be used with my nurses costume. They were the biggest hit of the party! I told my guests about Vitality Medical in case they wanted to one day take my idea and have some fun. Though these weren't used for what they are meant to be used for...they were perfect for my party and created a fun filled memory!